Instructors: Neil Ellison: 5th Dan Karate, 1st Dan Torite Jutsu, 1st Dan Okinawan Kempo | Stuart Howe: 5th Dan Karate, 1st Dan Torite Jutsu, 1st Dan Okinawan Kempo Teesside Dragon is a study group for adults interested in self-development through training in the martial arts of Wado Ryu Karate, Xing Yi Quan and BaGua Zhang. Training involves the study of body dynamics, acupressure, and has a strong emphasis on practical application. Though many of the practitioners are highly experienced, adult beginners are made welcome. 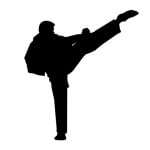 The group is especially suitable for those who have previously studied a martial art, and wish to develop in a new direction. There is no required uniform or grading system.